At the turn of the century, steel-framed skyscrapers transformed our city skylines. The availability of high strength and relatively low-cost of steel enabled architects to shatter the technical limitations of stone and mortar and build upward. Looking out over Austin’s horizon, we see steel’s impact loom over us each day. It’s a reminder that steel framed shipping containers have enormous potential as building components in everyday structures. At Falcon we count on steel’s resistance to warping, also known as tensile strength, to manufacture container-based structures to meet to our customer’s needs. But what is steel, and where do its helpful properties come from? The answer lies deep in steel’s tiniest building blocks. Steel is mostly iron with a small amount of other elements, such as carbon and chromium, smelted in. In iron’s pure form, the iron atoms arrange themselves into a cubic lattice as depicted below. Iron atoms in a perfectly cubic, but relatively weak, structure or lattice. However, pure iron’s atomic arrangement is fairly easy to break and warp, which is why pure iron is relatively soft and malleable to hammering. Introducing differently sized atoms to iron’s lattice creates distortions in the structure. The iron atoms try to hold onto their neat cubic formation but end up bending around the distortions; the perfect cubic mesh begins to run at contrary angles. In this piece of steel, a larger chromium atom has pushed the iron atoms out of formation, creating distortion to the grain. Like in lumber and fabrics, the orientation or angle of the atomic pattern is called the grain. 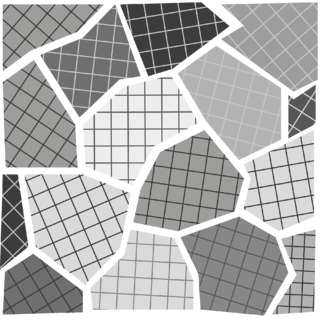 While a piece of perfect iron would have one continuous grain, the introduction of imperfections breaks the lattice into many grains that collide with each other. The boundaries between different grains are remarkably ridged and lock up the structure like stiff scars running through softer tissue. Above is an artistic representation of the atomic structure of steel. The white spaces at the borders of these grains are called grain boundaries. They are significantly more ridged than pure iron’s typical structure. The strength of steel’s abundant grain boundaries does come with a trade-off: the greater the strength, the less the flexibility. High-carbon – and thus high-strength –steel will snap before it bends. There are construction applications where flexibility is helpful. For instance, it is better for a building to slightly bend during an earthquake than to break. Steel comes in several varieties, called alloys, with different amounts of non-iron elements. Builders must select steel alloys understanding that the strongest choice will also be the most likely to snap. 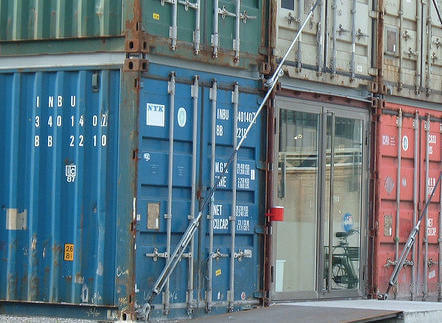 Shipping containers manufacturers use an alloy, of commonly referred to as “corten steel” or weathering steel. The term “corten” is a combination of the steel’s defining characteristics: “COR-rosion resistance” and “TEN-sile strength.” Unpainted, corten steel will form an outer layer of rust that minimizes deeper rust penetration. 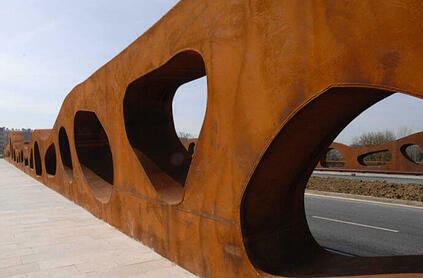 Many architects and installation artists use corten steel because of the aesthetic appeal of the rust exterior. Shipping container experts like Falcon Structures favor corten steel for its protective qualities. We paint shipping containers to prevent rusting, but when the paint does chip, the rust will go no further than the exposed surface. Instead of spreading like a metal-eating rot, the rust forms a protective scab, minimizing damage. The shipping containers used in this retail structure have a bit of rust at the edges, but still maintain structural integrity. Freita shop entrance, Denna Jones, 2006. CC-BY-2.0. Thanks to corten steel, we can count on shipping containers to hold 480,560 lb. on their corner castings. The weathering protection is also key to shipping containers’ long term value retention—75% for at least 25 years. Corten steel construction is a key reason we’re confident that shipping containers will become a convenient and cost-effective building component for off-site construction. After all, they’re already built from the stuff of sky-scrapers. Do you need the strength of steel for your work space, living space, or industrial equipment protection? Give us a call at 877-704-0177 or email us.